Chinchillas soon lose weight and become dehydrated if they do not eat and drink properly, therefore, if your chinchilla is unable to eat by himself through illness, dental problems or an operation, it is necessary for you to start hand feeding for a while. You will also have to give him water if he is not drinking He may have had a tooth/teeth filed, which has made his mouth sore and so he is reluctant to eat, or he may be eating very little through illness or while recovering from an operation. Whatever the reason, it is imperative that you feed your chinchilla by hand, because if chinchillas do not eat for a while, their gut action slows down and can even stop. Please scroll down to see pictures, videos, food ideas and quality of life. If your chinchilla has had teeth filed, for example, he most probably will have been given a pain killer by the vet, so you may find when he gets home, he will start eating straight away. Hopefully, this will continue, but keep an eye on him, because when the pain killer wears off, he may not want to eat. You will probably have been given a liquid feed to administer. This is usually in the form of 'Science Recovery' or 'Critical Care'. These are complete foods in powder form, containing essential nutrients for poorly chins or chinchillas recovering from illness and/or operations etc. 'The levels of protein, carbohydrates and fibre are elevated above that of a maintenance diet as required in higher levels during illness and recovery'. If your chinchilla is not keen to take this or perhaps he requires long term hand feeding, you can make a mixture yourself by grinding up pellets, hay and maybe add some calcium/mineral/vitamin supplements. The easiest way of grinding pellets, is by using a a coffee grinder. Make sure it is ground well and the particles are very fine. 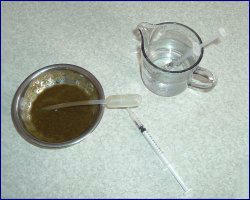 Remember, this is to be added to water and must be of a consistency that you can syringe into a chinchilla's mouth. You may be lucky and your chinnie will take the soft food from a spoon, but if not, you will have to use either a small plastic syringe or pipette. It depends on the food you are using as to which you find easier to use. Sometimes, a pipette is better if the food is a little grittier, but a syringe works well when using a smoother liquid food. Sometimes the syringe can clog and/or it might squirt out - just be careful this doesn't happen when you are placing it in your chinnies mouth. I find a 1ml syringe easiest to use. Always check, to make sure there are no air bubbles in the syringe, before you start feeding. If you are using a 1ml syringe, remember this is only a very small amount, so make sure your chinnie is getting enough food. Obviously, the amount a chinchilla will eat, varies on the state of their health at the time of feeding and also their weight. Hopefully the amount will increase as the chinnie improves. Just to give you an example ... I hand fed one of my chinchillas for over 2 years .... She could eat 125mls plus of liquid feed a day ... but this was my own mix of ground up pellets with supplements and she was a big chinchilla. Remember, this is just an example to give you some idea. 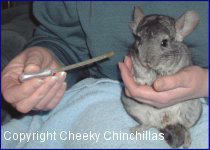 The quantity will depend on the size of the chinchilla and what you are feeding. 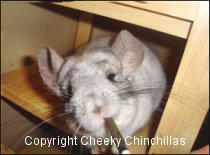 'Science Recovery' is a complete food and more concentrated, so your chinchilla will not eat as much as your own mix. It includes high levels of dietry fibre and essential vitamins. Instructions on the Science Recovery packet suggest that you use one sachet per Kg of body weight per day ALWAYS read the instructions on the packet and if in doubt consult with your vet. It is best to use some sort of measure to weigh out the ground up food before you add the water. This way, you will know how much your chinchilla is getting each time. 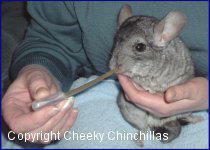 Hand feeding chinchillas can sometimes be a little difficult and often very messy! It is a good idea to either sit the chinchilla on a towel on your knee or wear an apron. 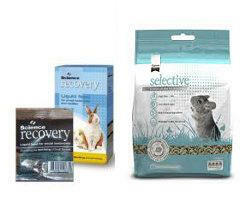 Science Selective Chinchilla is a nutritionally complete and balanced diet suitable for all chinnies. The 'crunchy' extruded pellets are easy to hold (easy to grind down) and make a good alternative for chinnies that have tooth problems and find other pellets hard to eat Beaphar Care Plus is also an extruded pelleted food for all chinchillas, but again, it could also tempt and encourage chinchillas with dental problems. I use some of this as a treat for my chinchillas. What Beaphar say: The Beaphar Care+ range is the first, totally complete, super premium food available for the small pet, offering the highest possible quality and formulation known to man. The high quality proteins and Omega 3 and 6 fatty acids ensures that an animal will have a healthy and long life with out experiencing the diseases caused by nutritional deficiencies. The foods also contain prebiotics and Yucca extracts and the chelated minerals improve absorption and supply to the body. Remember, as with pellets, any new hay should be introduced slowly. Quality of Life When a chinchilla has been ill, has undergone surgery or has had dental issues, he may for a while, need extra special care and if he is unwilling to eat, he will need to be hand fed, as it is vital to keep the gut stimulated. Hand feeding is very often necessary when a chinchilla has had some dentistry work done and he will not eat because his mouth might be sore and he finds it painful. Hopefully, after hand feeding for a few days/weeks, he will pick up and start eating again on his own. Unfortunately, there are times when we have to let our pets go and hand feeding is not the answer, if the animals are suffering. When and how do we know if they have some quality of life? Primarily, you will have discussed this with your vet and hopefully, he or she will have given you some good advice and guidelines. Also, use common sense, as you know your chinchillas’ behaviour patterns as to what is ‘normal.’ If they do not start eating on their own after some time, what do we do? Do we continue to hand feed? The answer is definitely yes, if they still have a quality of life. From my own experience, when a chinchilla can’t or won’t eat on his own, but willingly takes food via a spoon or syringe, is putting on weight and still wants to come out to play, then I would say he still has a quality of life. However, if after a while, your chinchilla is not willingly taking food, he may well be suffering.How do we know if they are in suffering or in pain? If he is losing weight and you are literally forcing food down, he just sits around all the time, doesn’t want to come out and he shows no interest in anything, then his quality of life is poor. If he has deteriorated so much and you are forcing very small amounts of food into him,you might be keeping him ‘just alive’. It would probably be kinder to have your pet put to sleep. This is an awful decision to have to make, but I think we should always remember that we keep our pets alive for their sake and not for ours . If your chinchilla is recovering from an operation/dental problems etc but can still manage to eat hard food, but doesn't seem to be interested in his pellets, you could offer him a little mixed. I would NOT as a rule recommend the use of mixed food (see Feeding ) only quality pellets and hay, but when chinnies are ill it can sometimes help to get them started again.You could even try some other foods which you might not normally use, for example, a little organic baby food. Remember, this is for short term, medicinal puposes to get your chinnie eating: a healthy chin should only be fed quality hay and pellets. A responsible chin owner knows what a healthy diet should be ... As I said earlier, if a chinchilla does not eat, the gut slows and he can just give up altogether. If your chinnie is also having trouble eating hay (this is often the case when they have tooth problems) try using a softer hay e.g. Spillers 'Readigrass'.